Metal Sonic attempts to fight the heroic duo again in his own battleship, the Metal Carrier. This fight takes place in the skies on the Tornado, so the controls from Act 1 apply to this fight. Metal Sonic attacks with the 4 "jets" on his ship. These jets fire lasers across the entire length of the screen, and are fired in various patterns. Dodge them and attack Metal Sonic's cockpit to deal damage. At first, Metal will attack upside down, but after a few hits will attack from below upwards. After enough hits, Metal will fly ahead of you and try to attack you head-on. 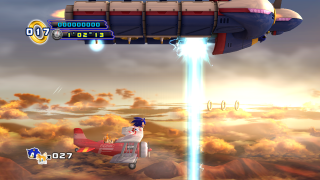 Around this point of the battle, Eggman rockets begin to fly into the arena. Some hit Metal's ship, and they spiral towards you as a result. While dodging both these rockets and Metal's frontward laser, do a Tailspin attack on the cockpit to put Metal's ship out of commission. Metal will evacuate the exploding ship and fly away, ending the boss. This page was last edited on 24 April 2018, at 15:43.